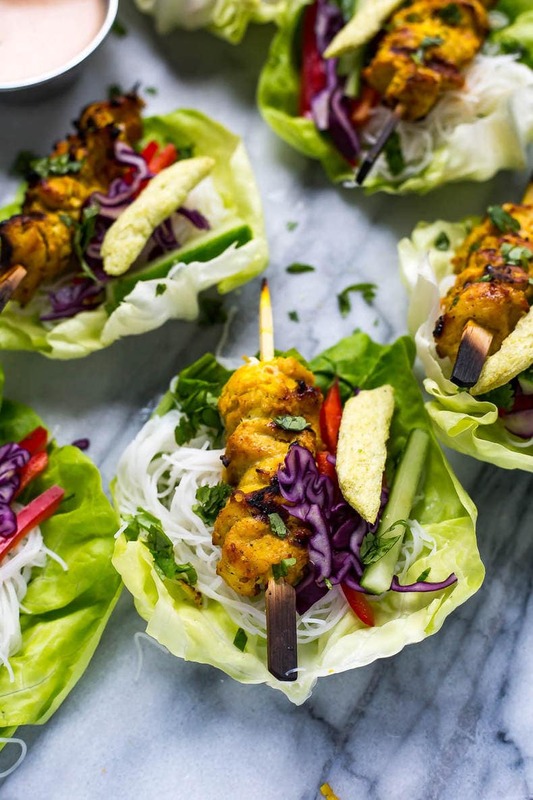 These Chicken Satay Lettuce Wraps with an easy coconut-peanut dipping sauce, tons of veggies and vermicelli noodles are a deliciously light dinner or fun, healthy appetizer! Hey Monday! Here we are again with a deliciously fresh weeknight dinner idea that is completely blowing my mind. 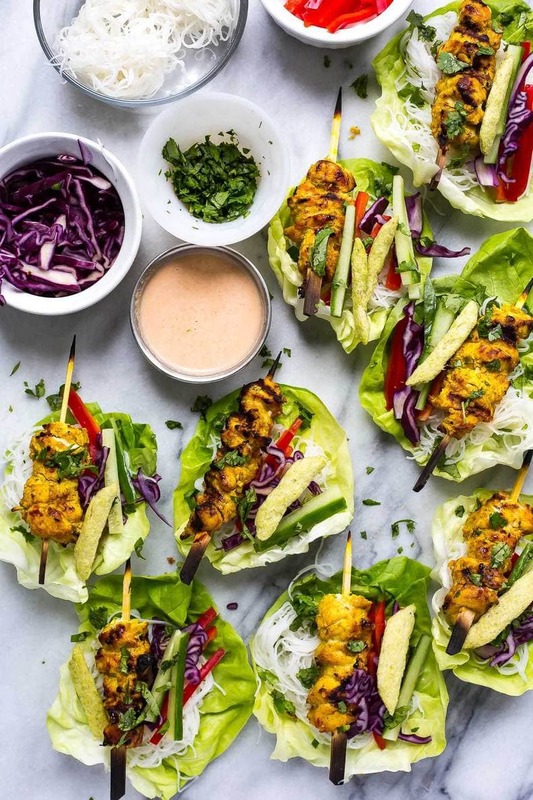 They take a little bit more time than say, these 20-minute Potsticker Bowls, but I promise that the little bit of extra effort to marinate these mouth-watering chicken satay skewers is worth it. Lettuce wraps are all the rage right now, and I know I'm just hopping on the bandwagon of another food trend, but can you believe I have never made them before? It's not like I've never had the opportunity. I've seen them on the appetizer section of a bunch of different restaurant menus and in the pages of my fave foodie magazines. But for some reason, they have really just never appealed to me. For one, most lettuce wraps seem to be the same. Ground chicken, soy sauce, sesame oil and rice vinegar, and maybe a couple mushrooms and some scallions. There will be the odd steak version that looks appealing to me, but this girl can't always afford steak – and if I can, it sure won't be used in a lettuce wrap of all things. Eating with my hands is another reason I'm not a big fan of food like this. Like, I won't even eat a sandwich if given the opportunity because with me, things get messy. I have this tiny mouth that makes eating stuff like this a little more challenging because I can't really eat without getting whatever it is all over my face. And lettuce wraps strike me as the type of food you eat with a crowd. Like at an upscale bar and grill while out celebrating your friend's birthday or something. Yes, my aversions are strange, but I'm positive I'm not alone here. I am already lacking a certain level of discretion and class as it is (???) and the last thing I need is to be wiping food off my freshly made-up face out in public. But again, we come back to the fact that I have never actually ever tried a lettuce wrap, so my fears have so far been unwarranted. And I wanted to put a fun little spin on what everyone else is eating, so I thought it high time to not only try lettuce wraps for the first time, but also get in on the chicken satay trend. I know, I'm such an exciting person aren't I? 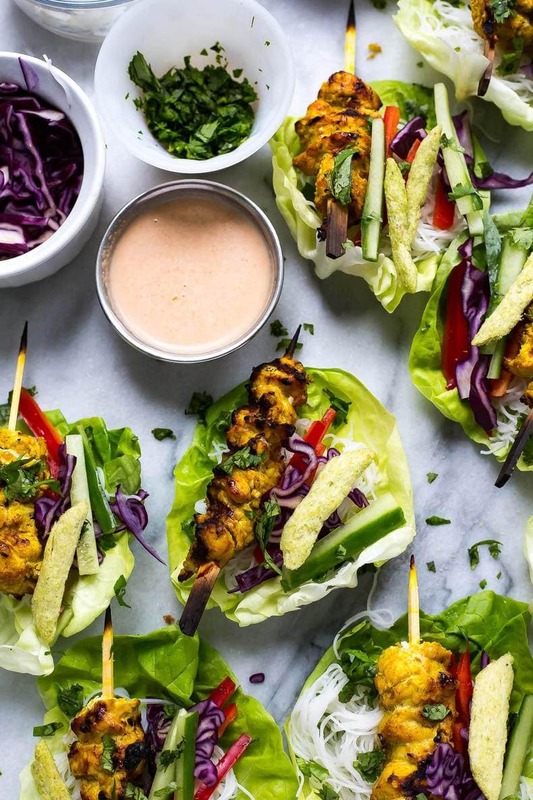 Let's dive a bit further into these amazing Chicken Satay Lettuce Wraps. First of all, marinating the chicken for at least 20 minutes with the right spices is key to a delicious satay. And yes, you do need to BBQ the skewers to get the right flavours and ensure the chicken stays nice and juicy. 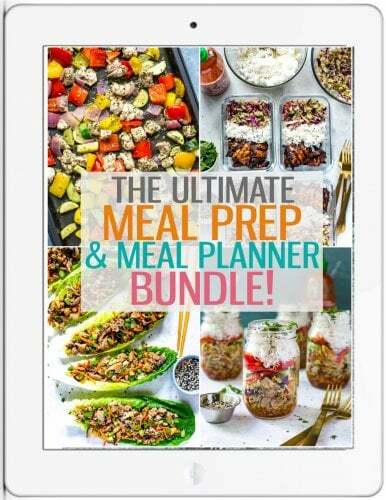 All of this little extra preparation is totally worth it, and it's not too difficult! I've done my own spin on this popular southeast Asian-inspired appetizer and used chicken breasts as opposed to leg and thigh meat, but only because I always have boneless, skinless chicken breasts on hand in the freezer and I tend to like leaner cuts of poultry in general. You can definitely feel free to use boneless, skinless thighs here though and just cut the meat into smaller cubes like I did. Lemongrass is one of the main ingredients that you may not have on hand at home already, and you can also feel free to omit it if you don't feel like grabbing it just for this recipe. However I should say that depending on where you buy it, it's super cheap and keeps well in the fridge for other recipes like Thai curries and fun noodle bowls. I usually buy one or two stalks at a time from the international produce section of my grocery store because they only cost like 40 cents or something – lemongrass is usually stocked with other ingredients typically used in Asian-inspired recipes like daikon radish, turmeric roots, bean sprouts etc. 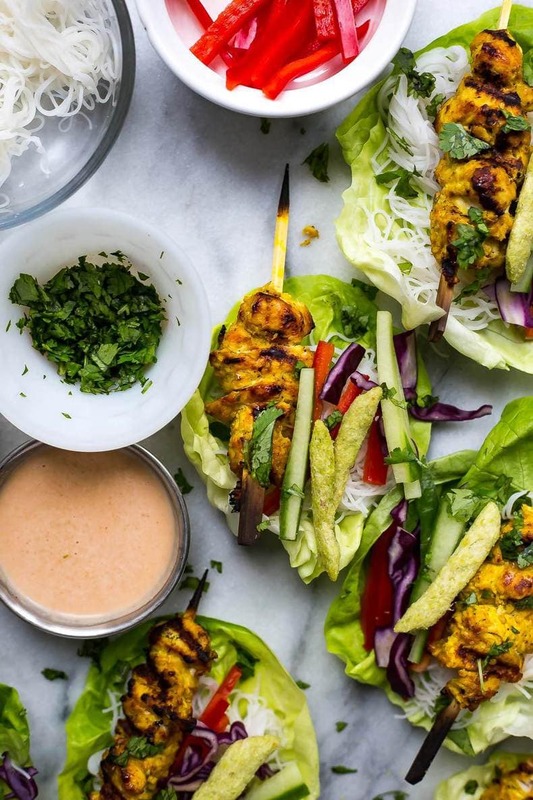 Once you get that one specialty ingredient, the marinade is pretty much all pantry staples and spices like turmeric, chili powder, garlic and ginger. 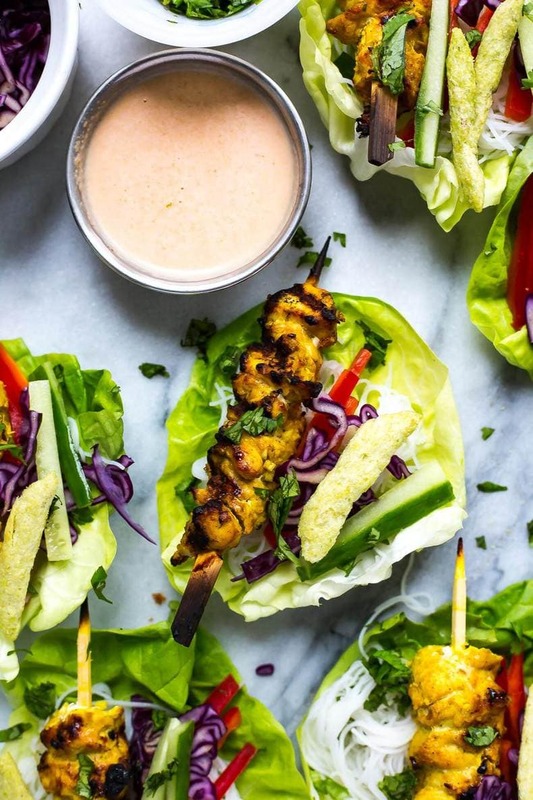 From there, these lettuce wraps are all about veggies, vermicelli noodles and my fave coconut-peanut dipping sauce. 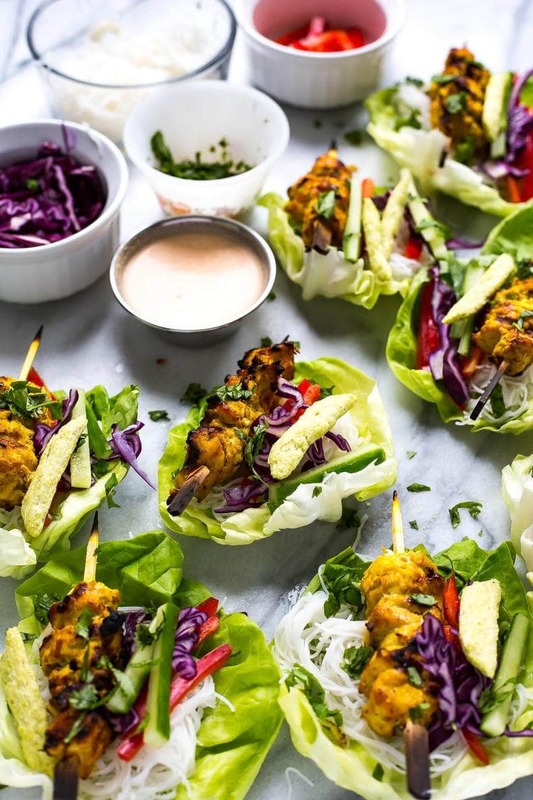 Though not necessary to serve alongside these Chicken Satay Lettuce Wraps, I highly recommend you whip some of this up. If there's any leftover, it's a great stir fry sauce or dipping sauce for chicken fingers and the like. It is basically peanut butter, coconut milk and a bit of lime juice and some chili garlic hot sauce (aka sriracha). 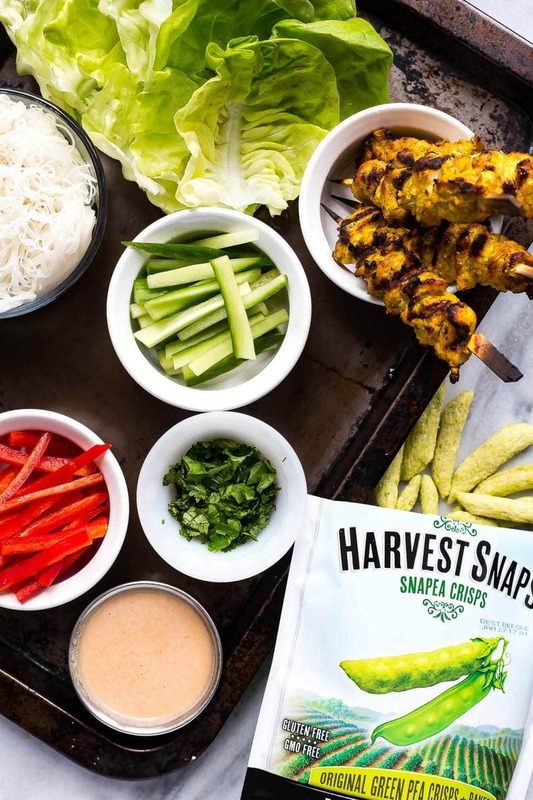 Mix it all together while the chicken satay skewers are cooking on the grill and while you assemble the rest of the ingredients in your lettuce wraps. SO good. I just might make this for dinner again this week. 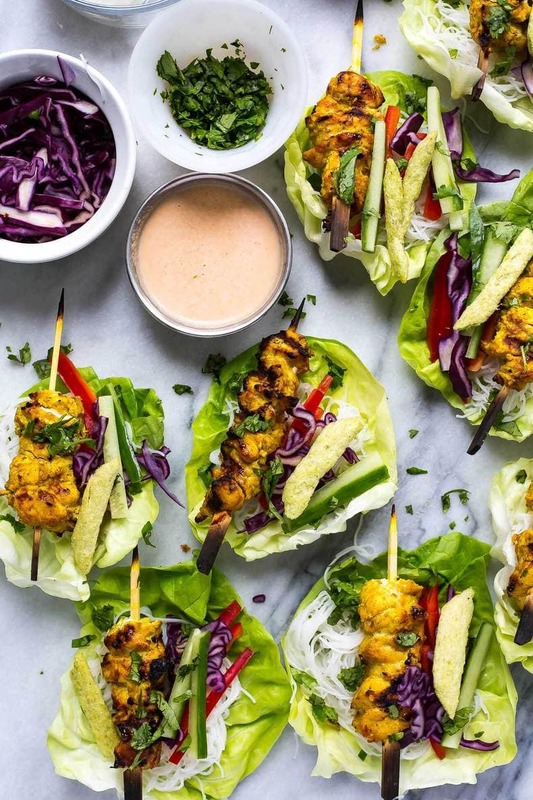 Will you be making these Chicken Satay Lettuce Wraps? What kinds of handheld food do you love? I have to admit I'm a sucker for a good burger every once in a while, although I'm trying to limit the amount of bread I'm consuming. Maybe a burger in a lettuce wrap is the next possible solution to my cravings? In any case, I'm SO ready for summer food! 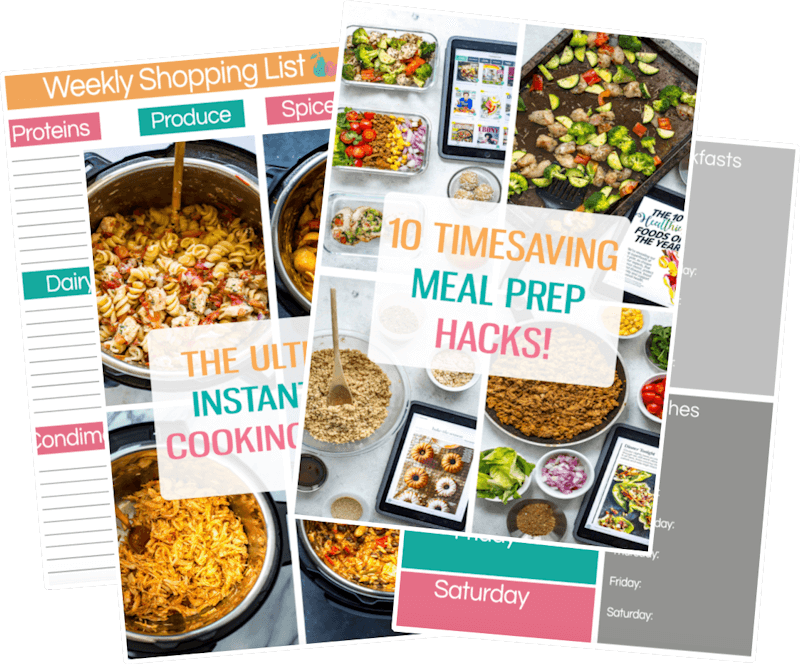 And as usual, if you try any of my recipes be sure to let me know on Instagram, Twitter, Facebook or in the comments – I’d love to see what you come up with!? Preheat BBQ to high heat. Mix together marinade for chicken and cut chicken into small cubes. Marinate for 20 minutes. Meanwhile, mix together peanut dipping sauce and prepare veggies. Cook the vermicelli noodles for 2 min in boiling water. Stick chicken on small skewers and grill for 10 minutes, flipping halfway through. Meanwhile assemble lettuce wraps by putting some vermicelli noodles, red cabbage, red pepper, cucumber and Harvest Snaps in each. Remove chicken from heat and place one skewer on top of each wrap. Garnish with cilantro and serve with peanut dipping sauce. Enjoy! Great recipe, full of healthy and delicious ingredients. Fast to make apart from marinating time, but with a bit of planning this is easy too. Love the vibrant, beautiful photos that go with this recipe! A winner I am cooking tonight!